Quick Update: Techmeme has picked up on a thread that analyzes Barack Obama.com’s social networking capability. Check out Steve’s (Zdnet) post here and a more detailed observation from Tony here. Political brand marketing is a topic I’d love to investigate further. Many bloggers, including Scoble, have dissected the candidacy of the three leading Democrats in the fray – Clinton, Edwards and Obama. One of HBR’s list of breakthrough ideas is leadership that is rooted in Hope. Our study of effective executives has uncovered many ways in which their decisions, words, and actions make the people they lead more hopeful. Collectively, these practices are the basis of a leadership tool kit for building and sustaining hope. But the most important change comes when a leader is simply more mindful of this vital part of her or his mission. I moved to Illinois over two decades ago. I was a young man then, just a year out of college; I knew no one in Chicago, was without money or family connections. But a group of churches had offered me a job as a community organizer for $13,000 a year. Do you think Obama will “BARACK THE VOTE”? Kind of an interesting approach to politics…let’s see how things pan out. I wonder if Jeremiah will increase Obama’s social media score? I think that this is an attempt to woo young voters…something that might be critical….I just hope he’s sincere in doing it. Well, looks like techmeme has an interesting discussion (http://www.techmeme.com/070211/p15#a070211p15) on Obama.com’s social networking capabilities… Given Edwards blog campaigns recent stumbles it’s obvious that all three leading democratic contenders view social media as essential and are trying their best to set the standard. It’s official. Politics and social media is a necessary marriage made in hell! I think it will largely be determined by who is the victor. Ultimately, in both instances, the victor better be the common user; else it’s a waste of time. I did catch the article on techcrunch on the bug. Looks like things are back to normal, though. Edwards had his own stumble when some of his bloggers where cussing! What’s important is how you recover from these foul-ups. There’s definitely no room for error in closely contested elections. 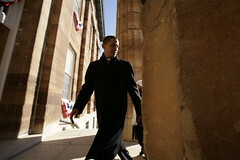 barak will barack the votes because he believes in god. god is the one who gives leadership and god is giving him grace to become america president,. But I’m sorry, this is not a political forum/blog, rather one that dissects marketing aspects of subjects ranging from politics to technology.